Over the last decade, consumer demand for local, healthy, fresh food has rapidly increased. The surging demand for local food creates an excellent opportunity for farmers to feed their communities which both benefits their business and local economies. It is this mutual connection between local farmer and local consumers, as well as all the intermediary connectors – aggregators, processors, and distributors – that form the foundation of strong local and regional food systems. We already see the growing trend in local food system development. There is an 86% increase in the number of farmers markets since 2008 (1,2) and a 165% increase in the number (3) of operating local and regional food hubs since 2007. The potential of these growing marketplaces is not merely anecdotal—data from the 2007 and 2012 Agriculture Censuses show that farmers who market food directly to consumers have a greater chance of remaining in business than similarly sized farms that market only through traditional channels. However, many obstacles still exist for farmers, aggregators, processors, distributors, and markets that seek to strengthen their local food system and for their customers seeking healthy, local, accessible food. These obstacles are especially intimidating for small to mid-scale farms, minority or socially disadvantaged producers, and food insecure populations. For example, a farmer may want to sell directly to a local school but is unable to because of the high cost of a food safety certification. The school’s facilities may also be unable to process and store local food products. Greater support for local and regional food systems development is sorely needed to keep pace with growing consumer demand. The USDA currently runs several “small but mighty” programs that do just that. These programs include Farmers Market and Local Food Promotion Programs (FMLFPP) and Value-Added Producer Grants (VAPG). While the programs successfully support local and regional food system development, they do not receive mandatory federal funding and are thus vulnerable to funding cuts each year. Included within the Senate’s version of the Farm Bill is a program that would strengthen and stabilize support for local and regional food systems. 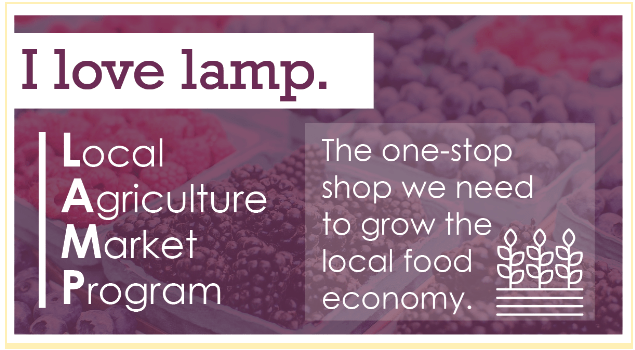 The Local Agriculture Market Program, referred to as LAMP, consolidates FMLFPP, VAPG, and other programs into a single program. By doing so, it streamlines program delivery and reporting and, more importantly, establishes permanent baseline funding for all programs at $60 million each year. Farmers Market Promotion Program and Local Food Promotion Program (FMLFPP): An existing competitive grants program to increase and strengthen direct producer-to-consumer marketing channels. Past FMLFPP grants have led to the creation and/or development of agricultural cooperatives, producer networks, CSAs, farmers markets, food hubs, and more. Value-Added Producer Grant (VAPG): An existing competitive grant program that provides funding to farmers and groups of farmers to create or develop value-added producer-owned businesses. These enterprises help increase farm income and marketing opportunities, create new jobs, contribute to community economic development, and enhance consumer food choices. Public-Private Partnerships: This new initiative would encourage the formation of multi-stakeholder public-private partnerships focusing on regionally targeted or foodshed-level food systems planning and development projects; using federal investment to leverage additional investments and expertise from commercial banks, the Farm Credit System, Community Development Financial Institutions, foundations, and non-governmental organizations. Food Safety Cost-Share: An exciting new program that would provide farmers with cost-share assistance to help become food safety certified and make necessary upgrades to on-farm food safety infrastructure. Receiving food safety certifications can allow small and mid-scale farmers to access larger or high-value markets. The new program would receive $60 million per year in mandatory funding on a permanent basis. Broken down into individual program funding, LAMP funding is consistent or above the funding level of existing programs like FMLFPP and VAPG. However, if collective funding dropped much further below $60 million, individual programs would begin to see decreases in funding. 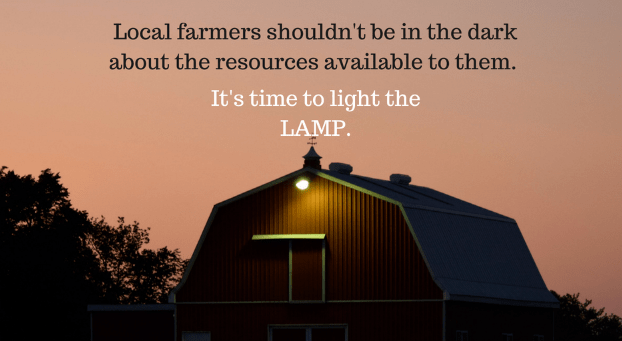 The inclusion of LAMP in the final version of the farm bill would ensure continued and strengthened support for local and regional food system development. While the Senate has clearly shown support for local food system development through the creation of LAMP, the House has done the opposite. The House version of the farm bill eliminates mandatory funding for FMLFPP and VAPG, seriously endangering both programs. As farm bill negotiations head into the Conference Committee it is vital for both farmers and consumers to show their support for LAMP and urge their representatives to include it in the final version of the farm bill. Take Action! For information on how you can contact your legislators and ask them to support LAMP, click here. The Senate’s version of SNAP (the Supplemental Nutrition Assistance Program, also known as food stamps) which makes no major reforms to eligibility or work requirements. The Senate’s creation of Farming Opportunities Training and Outreach Program (FOTOP), which is the consolidation of Outreach and Assistance to Socially Disadvantaged and Veteran Farmers and Ranchers Program (Section 2501) and Beginning Farmer and Rancher Development Program (BFRDP). FOTOP includes permanent baseline funding for both programs. We encourage you to connect with the organizations listed below to learn more or take action around these farm bill issues. 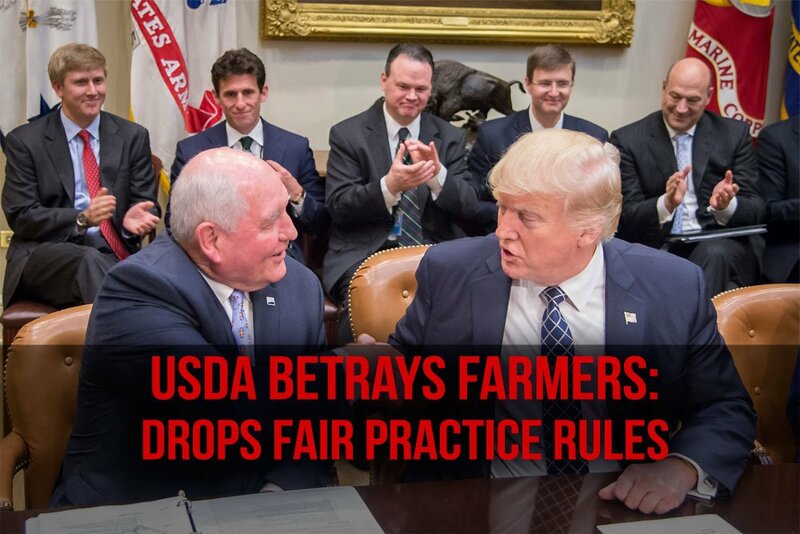 Catch up on all things Farm Bill here. Running a Food Hub: Learning from Food Hub Closures, Vol. 4, August 2017, USDA Rural Development. Join thousands of individuals and organizations across the globe to celebrate #GivingTuesday, an international day of giving back. 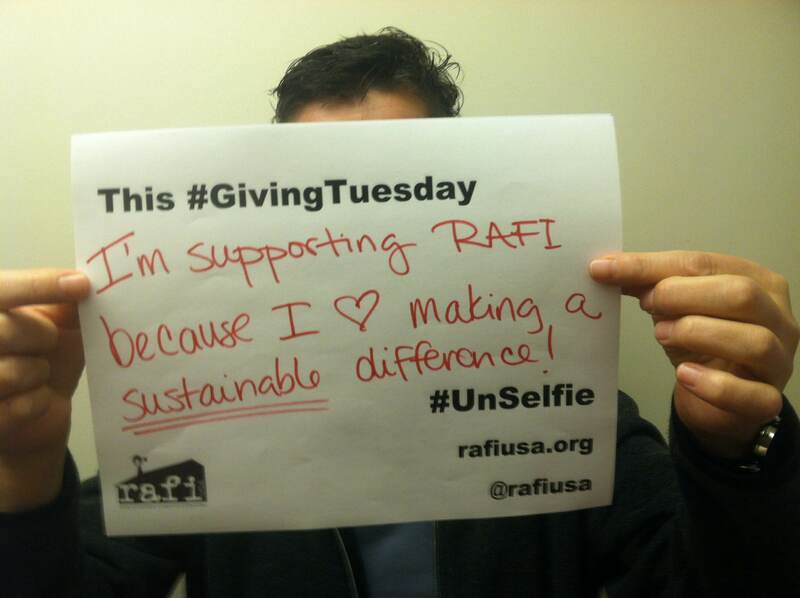 Celebrate generosity by giving your time, talent, money or voice – and start by sharing your very own #Unselfie. 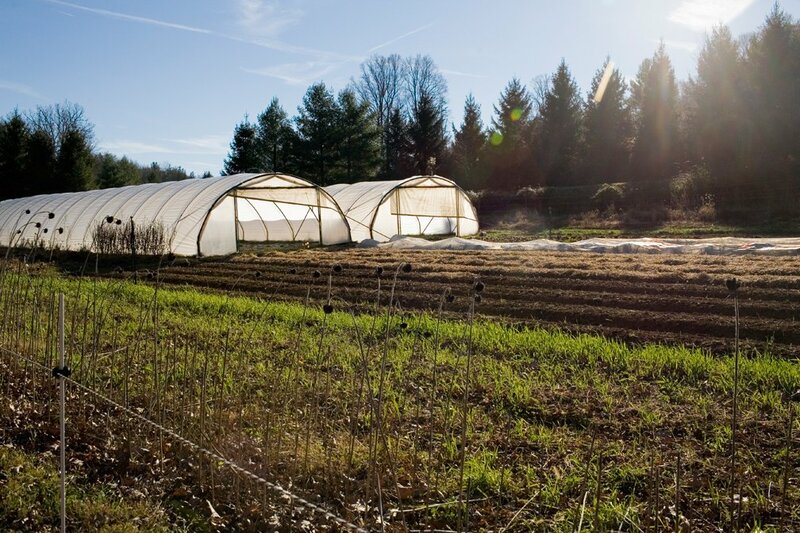 The Agricultural Reinvestment Fund is entering its 20th year in providing cost-share grants to innovative farmer-led projects in North Carolina. Each year, this competitive grant program selects a handful of farmers who have amazing ideas that focus on innovation, enterprise development, and growing a successful, sustainable family farm business.